This is a page dedicated to “Frequently Asked Questions” and helping you understand some of the local terms and slang that are often used in a manner that you may not understand. We Do Not Do "Walk Ons"
What is a "Walk On" ? A "Walk-On Trip" is just a random group of individuals mixed together on a boat to go fishing. 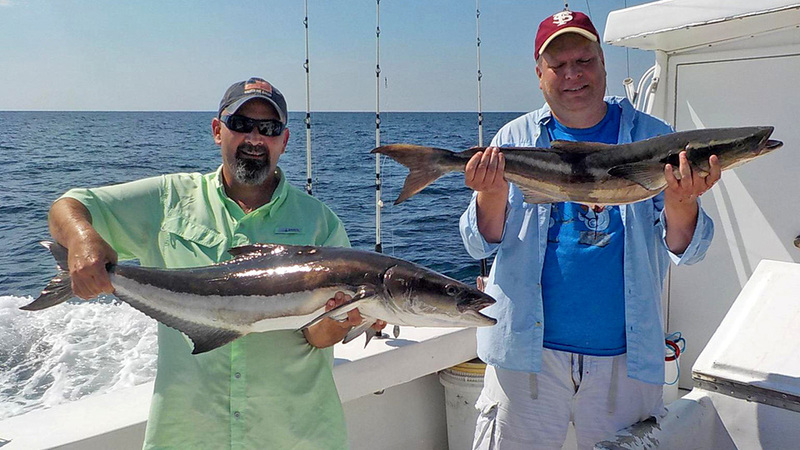 What do I need to bring on a deep sea fishing charter on the Intimidator? You will want to bring plenty of food, drinks, sunscreen, sunglasses, hat, camera, film, and motion sickness medication. However, motion sickness medicine works best when taken as per the directions, don’t wait until you feel bad! For those who may have a woozy stomach, contact your personal doctor ask for the Transderm Scop or what is commonly known as the “patch.” It seems to have helped a lot of people. What is included in the price of the Intimidator? All of the necessary items needed for a successful trip, such as bait, tackle, rods, reels, licenses, and fuel. We make our own ice to ice the fish during the trip. When do we need to arrive to catch the boat? 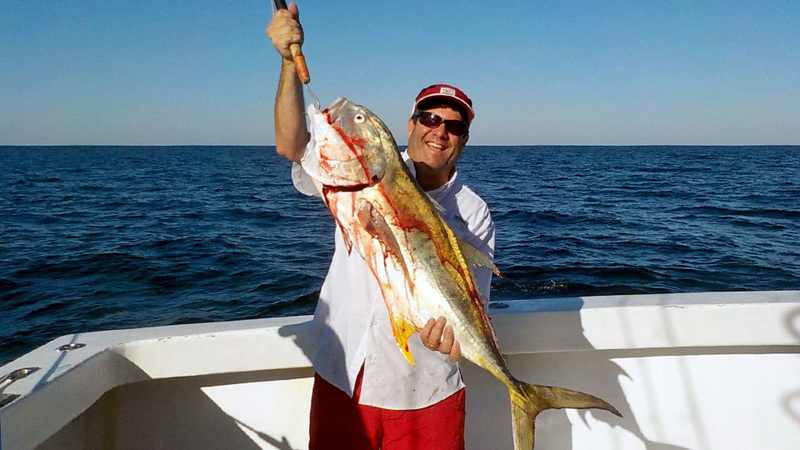 In most cases, fifteen minutes before the scheduled deep sea fishing charter departure time is usually sufficient. How are the mates paid? The price quoted for the fishing trip is for everything you need to go fishing not including the mate. Your mate works for gratuity and will make all the difference in the trip. 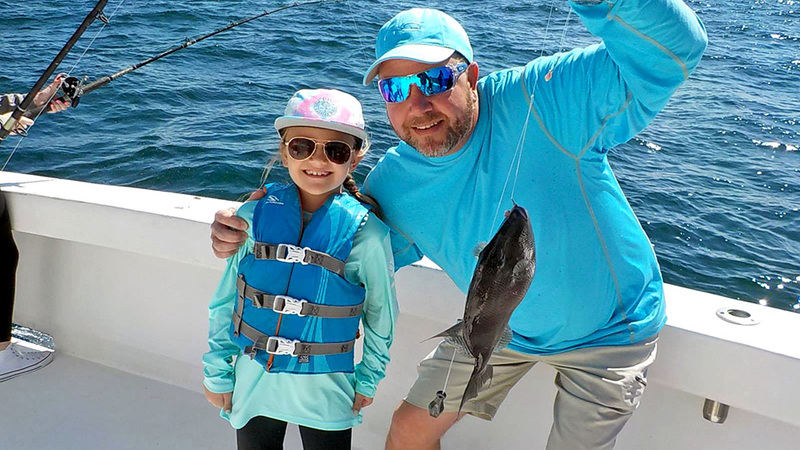 Some of his duties will include rigging the tackle daily, catching live bait, cutting bait, baiting hooks, untangling lines, helping kids and teaching first timers how to fish. They are particularly good at helping out the "old salt" with any new tricks or tips. They will usually arrive about one hour ahead of our scheduled departure time and may not leave until several hours after you leave. We kindly suggest 20% - 25% of the total fare paid. With a 25% gratuity fish cleaning is free. What if there are two mates? Normally on our day trips, extended trips and overnighters there will be two mates. They will split the tip and fish cleaning. Just remember they are down in the middle of the action with you. For me to keep good mates, I need to try to help make sure that they make a fair daily wage. Once again, we kindly suggest 20-25% gratuity. 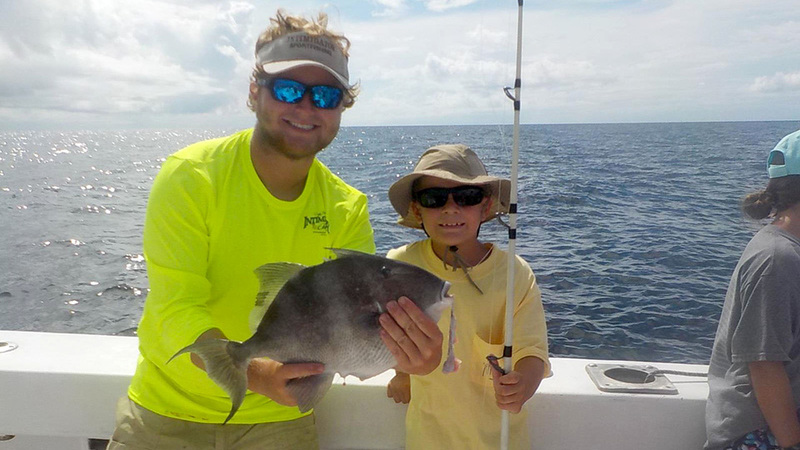 How far offshore will we go during a deep sea fishing charter trip? 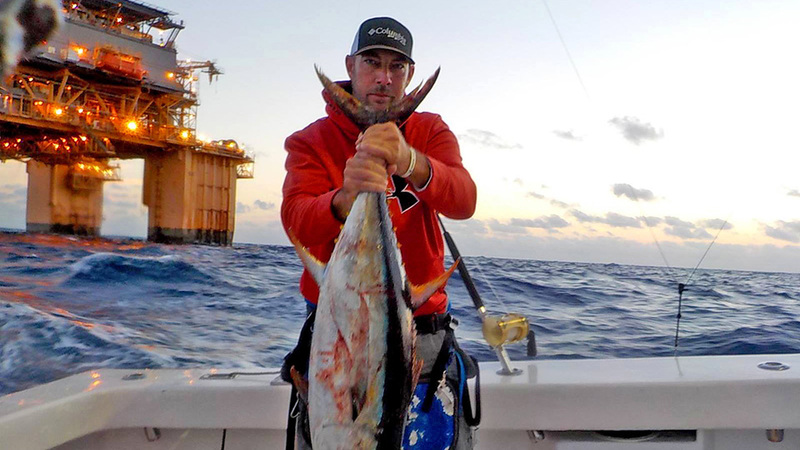 Depending on the length of your trip, we may venture anywhere from 10 to 20 miles on a half day trip, 75 to 140 miles offshore on a two day and up to 175 miles on a three day offshore adventure. The water where we fish on a bottom trip is anywhere from 50-150 feet deep. On an offshore trip the water may reach depths in excess of 6,000 feet. 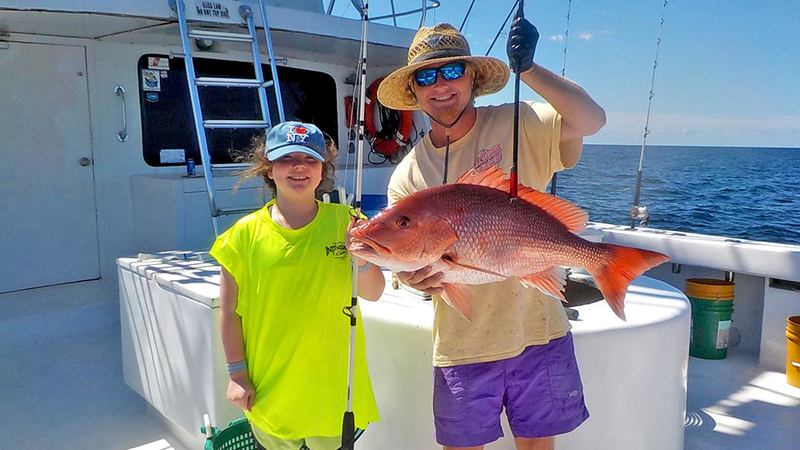 When is the best time of year to go on a deep sea fishing charter? There is no better time of the year to fish than in the spring or the fall. Unfortunately, it is not the best time of year for family vacations. During the summer, the water will warm up to over 80° and we will have to get in a little deeper water, but this is not a problem. The summer time is usually the calmest time of year and with three 24,000 Btu's air conditioners on the Intimidator, it will be nice and cool inside the cabin! In the winter you will find some of the very best fishing that we have to offer. The crowds start to thin out and the fish really go to biting! Remember some waterproof boots (soft sole) and sweat pants seem to work well. What kind of tackle will we use on the Intimidator? We strive to use only the highest quality dependable rods and reels available. We have a full array of tackle ranging from 30# spinning reels to the massive Shimano Tiagra 80W reels. For most of the bottom trips, we use the conventional Penn 4/0 and 6/0. We have over 45 combinations that we will select from to suit the trips needs. I have a left handed reel for you lefty's too. Can I bring my own personal tackle? Sure, as long as it is suited for the type of fish that we are fishing for. However, we cannot be held responsible for broken rods, reels or hearts! Rates are for 1 to 10 passengers? Exactly what does this mean? The Intimidator fishing boat is very large and 10 people can fish in comfort without getting tangled up or feeling like there is just nowhere to go to get out of the way. I am not trying to see just how many people I can get on the boat, it is simply done for your comfort. We only average 6-8 on overnight trips and about 10 on a day trip. 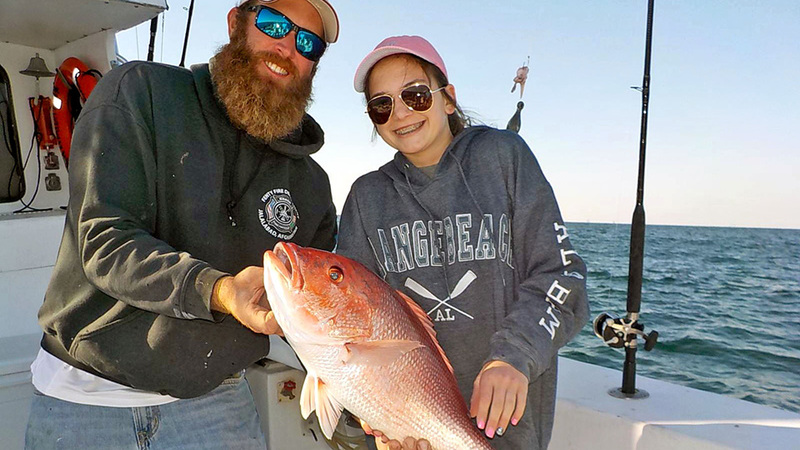 The prices are good for up to 10, so, if you bring less people it is more per person but you get a lot more room and catch more fish. What If I have more than 10 people? It is no problem; just add 10% for each additional passenger. In fact kids under seven are allowed to go for free. However, kids under seven must wear a life jacket while on board. Why must kids under the age of seven wear life jackets? In accordance with Alabama State law all children age 7 and under must wear a life jacket aboard any vessel within state waters. I'm the proud father of three kids and I truly want you to bring your kids along to enjoy your days fishing, therefore, leave no kids behind. (However on the longer trips such as overnight charters, we have a hard cap on the number of passengers, cannot exceed 10 people as per USCG law). What is a 6-pack boat? A six pack boat is just slang for a USCG determination of how many people a particular boat can carry. All un-inspected boats have a 6 passenger limit, but that does not apply to us. Through a rigorous inspection process from construction to yearly drills and equipment review we are allowed to carry up to 41 people. As mentioned before our base price is for 10 passengers. We can reasonably fish about 20-22 anglers at one time. If you have a large party we can certainly accommodate your needs. What are Private, Walk-On or Split party trips? • A "Private-Trip" is just you and your friends that you choose to bring with you on the boat. 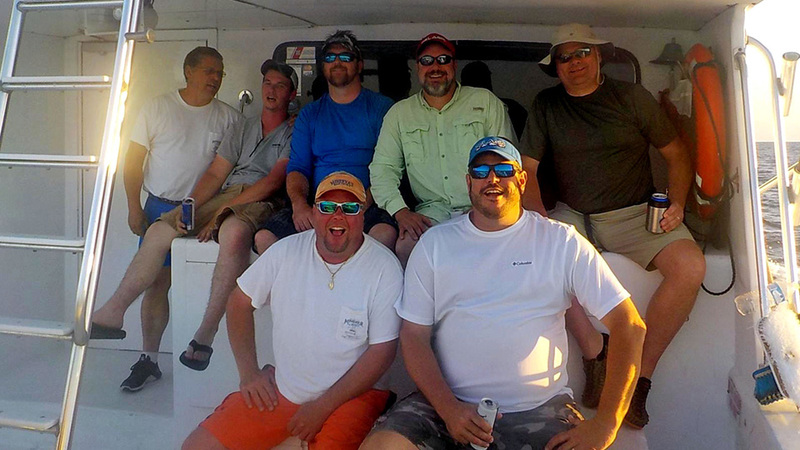 • A "Walk-On Trip" is just a random group of individuals mixed together on a boat to go fishing. 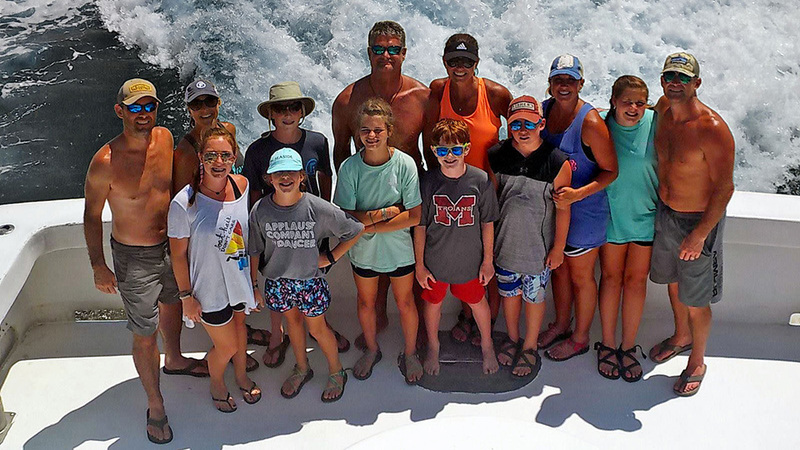 • A "Split-Party Trip" is a term used where you have two or more groups that do not want to pay the full price of a trip, (they each pay their part) but would like to go deep sea fishing with another group of like-minded people.